Welcome to H3 Maths » Blog Archive » Young Students save $m by putting Math to ink! In a submission to emerging investigators, middle school students Suvir Mirchandani and Peter Pinko use the Mathematics of Percentages to calculate potential savings in ink costs by changing fonts across all documents. Ink costs are a large, recurring expense for school districts worldwide. Moreover, ink production, usage, and disposal have a detrimental effect on the environment. Decreasing the amount of ink used can therefore have a positive impact on a school district’s budget and on the environment. This study identifies fonts that use ink most efficiently and estimates the amount of money a single school and a school district can save on ink by choosing efficient fonts for student handouts. 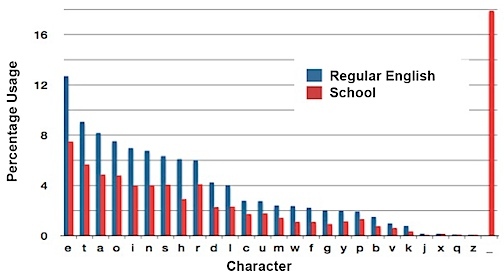 From a carefully selected sample of handouts used by the school’s teachers, the frequency distribution of character usage was determined. Based on these data, a document modeling an “average” school handout in terms of character frequency was created. This document was replicated with different fonts reflecting the current preferences of the teachers in the school. APVSoft APFill® Ink Coverage Software was used to estimate the ink usage for each of these font types (i.e., the percentage of a printed page that contained ink). A novel experiment was performed to verify these findings by cutting out enlarged shapes of the most frequently used letters in the most preferred fonts; the masses of these cutouts were then determined in order to estimate the relative difference in ink usage for different fonts. Based on the analysis, it was concluded that a switch to Garamond, the most efficient font, would reduce ink consumption by 24%, thereby decreasing environmental damage and saving the school district approximately $21,000 per year. Read their full submission here. by James posted under Uncategorized | Comments Off on Young Students save $m by putting Math to ink!